As we approach the school holidays the arts scene is cranking up for kids. The West Australian Symphony Orchestra is offering two movie screenings with live soundtrack: Harry Potter & the Goblet of Fire on March 29/30 and The Little Mermaid on April 26/27. Did you know it has been 30 years since Disney released The Little Mermaid? Dust off the costumes and get ready to sing along to Alan Menken’s Academy Award-winning score! WA has two youth orchestras and both offer hands-on concerts tailored for children. On April 6/7 the WA Youth Orchestra invites children aged 2–8 to experience live music in an up-close and personal setting. At Babies Proms concerts children learn about the instruments, are invited to conduct the orchestra and can join the musicians on stage. 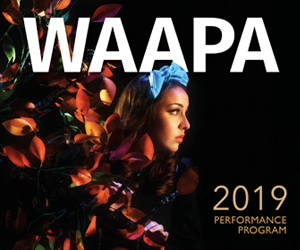 Also popular with kids and the carers, the WA Youth Jazz Orchestra’s similar Jazz for Juniors series on April 16-17 includes a have-a-go session at the end of the show. Puppets tell the story in Spare Parts Puppet Theatre’s Blueback. 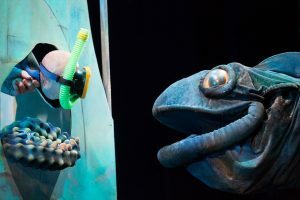 During the school holidays (April 13-27) Spare Parts Puppet Theatre will reprise an adaption of Tim Winton’s Blueback. The moving story captures the mystery of the sea and the majesty of an old fish called Blueback. The audience follows Abel’s journey from inquisitive boy to a man prepared to stand up for what he loves and believes in. Youth Week WA also coincides with the school holidays and Propel Youth is celebrating with their annual KickstART Festival from April 13-20. On offer are 40 free events and workshops celebrating the positive contributions young people make to our community. Craft, songwriting, collage, puppetry and a huge variety of classes are on offer for youth aged 12-26. There are some great holiday courses available for children. Fremantle Arts Centre offers two and three-hour classes including sessions on how to make your own piggy bank, t-shirt, cuddly toy, or explorations into photography, pottery and animation. Barking Gecko‘s drama classes on April 16-18 look great, with a fairy tale theme and classes catering for ages 5-7 and 8-12. The State Theatre is hosting two shows touring nationally with CDP Theatre Producers: Room on the Broom, based on Julia Donaldson’s much loved classic (April 23-28) and Billionaire Boy based on David Williams hilarious children’s book (April 24-27). CDP Theatre are the team behind The Gruffulo’s Child and The 13-, 26-, 52- and 78-Storey Treehouses and are pretty reliable for a great live show. Finally, on May 18 one of my favourite music educators Paul Rissmann returns to WASO for another EChO concert. Backed by an 11-piece orchestra Rissmann will explore the gorgeous children’s books The Giddy Goat and The Lion Who Loved in his gently invitational and entertaining style. Dive into the arts with your family and enjoy the magic that is autumn in Perth! Pictured top: children get hands on at Jazz for Juniors.